I must admit I find it incredible that I am up at 12:30 the day after xmas writing a blog post. I felt like I needed to write this while it was fresh on my mind. The way I feel right now though I think it will be fresh on my mind for a while. I treated the family to a movie the evening of the 25th. It has sort of become something of a tradition. Presents, family time, a meal and then off to the movies. This years agreed upon fare would be TRON:Legacy. I own the original TRON on DVD and watch it often. As a boy it was one of those films that captured a time and a place and to get back there I just pop that DVD in and I am instantly transported to an arcade in the 80’s. i love the actors and even though the story seems a bit weak its undoubtedly a groundbreaking film. 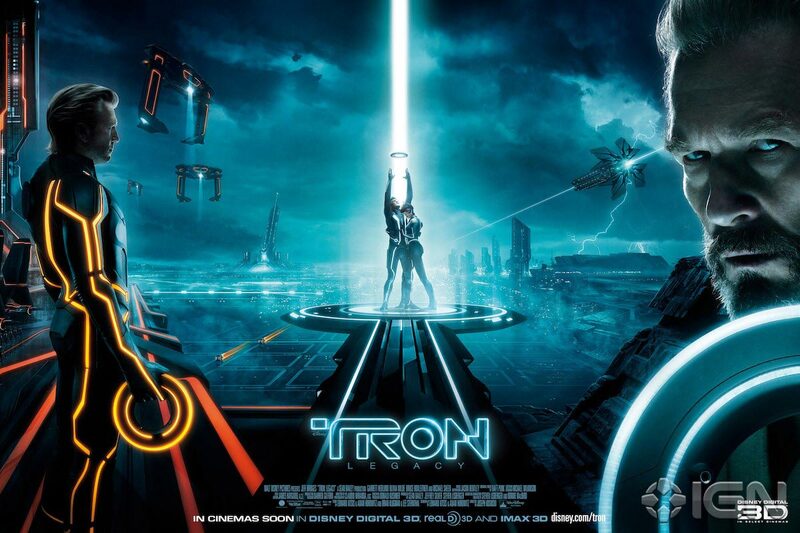 I was very excited when i heard about a sequel to TRON and MEGA excited to hear that Jeff Bridges and Bruce Boxleitner BOTH would be back not as cameos but actually reprising their roles from the original. I must say I was blown away. This was more than I could have ever expected. There are more nods and tipped hats to the old movie than I can detail here. Things as simple as dusty old hand held led tomy games to 80’s music blaring from a jukebox in an old arcade. Lots to love here if your paying close attention. The acting is very impressive. As already mentioned Bridges and Boxleitner are both quality actors but the newcomers Olivia Wilde and Garrett Hedlund do a wonderful job here as well. I was drawn in from the moment it started till it was over. The effects were of course TOP notch. The 3D was tremendous. I have seen quite a few 3D movies lately and this one had the best so far. Things shown in real perspective, items moving in and out of foreground and background, just really well done all around. The Chase scenes are AMAZING. The light cycles are back with major improvements to their appearance as well as their capabilities. The fluid dynamic of the camera work was truley awe inspiring. The costumes were well done and believable, albeit, aside from some glowing strips of light here and there they were almost nothing like the old movie. I did not miss the toga, greco-roman sash thing from the original at all. THIS is what a program would wear in a digital world in MY imagination for sure. There are two things I will never forget about this new movie and here they are in order of importance. The technology used to make Bridges young again as the character CLU is STUNNING. Benjamin Button has NOTHING on this. It looks and acts and FEELS like the real deal. I know its almost fully CGI and in a few fleeting moments of screen time it had a few creepy quirks, but its still AMAZING how real it was. Words cannot do it justice. Lastly, the soundtrack by Daft Punk was unbelievably perfect for this film. It is simply spellbinding. The 85 piece orchestra coupled with old school techno meets in the middle with superior results. My final thoughts today are..GO SEE THIS MOVIE. If you love the 80’s and enjoyed the first film this is canon and a MUST SEE. If you are not of that generation, disliked or have never seen the first film, SEE THIS ONE ANYWAY. I left the theater wishing I could see it again and sad that it was over. Being a film buff this rarely happens to me.